Pu’u O’o vent has been like my second home for a very long time. The flows that started coming down its NNE side back in Jan slowly covered what use to be a vast area of interesting and challenging lava flows from the early 1980’s. This is a series of posts from many of my hikes there this year. This area has played a major role in my lava exploring for the past 22 years. We have a history. This isn’t just another ooh look at my pretty photos type blog. My posts never are. 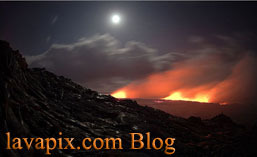 I document the volcanoes activity through still images and video. Seeing that this post covers my adventures from Jan – July 2013, there’s quite a bit to read and view. I could have easily made an hour or two long documentary but, of not many people would have found time to watch it all. Also loading something so large to the internet would have taken forever. I have my usual image galleries to view and this time 29 videos to watch. Some hikes the footage needed to be broken into multiple videos to keep them under 10 minutes. It’s definitely a lot to take in all at once but, hopefully you find it worth the effort. So, if this intrigues you to read on, get comfortable, you’re going to be here awhile. Or at the very least, “You’ll be back”. Anyone who lives here on Hawaii, The Big Island of Hawaii can tell you we had a very windy winter. Windiest I had ever experienced here. This hike would become a huge challenge due to these winds and the cold. Yes, it was 43 degrees at the coldest time with 45-50 mph steady winds. Throw in the rain and well, it was Pu’u O’o in the winter. Nowhere else I’d rather be. At this time the first flows were heading down Pu’u O’o’s nne side and soon it was going to forever cover what had been the most interesting route up Pu’u O’o for nearly two decades. I loved everything about this hike. Navigating it at night was my favorite thing to do. On a rare occasion I brought someone along they would marvel at what we were crossing and how we were headed up an active volcano vent that stood large and powerful in what was seemingly the middle of nowhere. Once daylight came they were blown away to see where we were. On this night the nne cone was extremely active and still growing. Large spattering events and a rolling overturning lava lake that at one time had lava bubbles the size of cars going off. No photos of the bubbles as we were huddled down in a huge downpour with those strong winds. I always hike in shorts and even then I didn’t bother with long pants. It wouldn’t have mattered anyways. It was cold regardless. The then growing west cone would periodically roar like four jet engines releasing gases into the night sky. Huge flames would go with the sounds. This is a scene I’ve saw many times in the past up there during other eruptive episodes. For me its a very relaxing sound. It’s when everything suddenly goes quiet that you need to start worrying. No worries that night as the jetting was ongoing the entire visit. No matter what I did the video was shaky and great photos were hard to come by. Considering the conditions they turned out fine. There would be no true sunrise on this day so, we headed back down along the slow-moving flow to a gently sloped area of Pu’u O’o. The area that would be of interest on the next hike. At this time is was not far from the leading front of the lava flow. There were nice slow-moving lobes of pahoehoe lava to warm us up and help dry our clothes. This pahoehoe flows lobes were much different from what you would see on the flats by the ocean. They were many times larger. Once rested and warmed up it was time for the trek back to the forest and the long hike back to the car. As we started our way down I knew this might be the last time I ever see this part of the trail again. So many memories. I could write a book solely based on the hikes up this route. I only shot video with the Nikon D800. You can easily hear and see the strong winds. The spattering lava was trying to shoot to the left but, it was quickly blown back to the right. There was the typical jetting sounds and very large flames from burning gases. I was lucky to get what I did considering how terrible the weather was. I’ve always had a thing for hiking to skylights no matter how far it might be. I’ve had my share of great experiences at dozens in the past 21+ years. This hike had two destinations. The skylight and as described in the next story, the ancient cinder cone. The skylight formed pretty much right where we had stopped on our way down Pu’u O’o the previous hike. Yes, my friend wanted to tag along again. He knows when I have a new adventure planned it’s going to be good and difficult at the same time. I wouldn’t have it any other way. This skylight was three-quarters of the way up Pu’u O’o so, there was a bit of climbing to do and much of the route still survived for now. The skylight was easy to locate even in a slight fog. Skylights always need to be approached ever so cautiously and this one was no exception. The great thing was after checking the entire surrounding area out, the skylight was right on the tube’s western edge so we had nice old cool lava to set our gear on and there was no fear of a collapse. Actually this tube was near its capacity and the flow was running extremely fast. What made this tube so much more different than others I’ve seen in the past was its close proximity to the source of the flow and it had two flows within it. Yes, that’s correct. Multiple flows. Most lava tubes have multiple chambers that can be layered several deep. They are most easily seen when the volume is low. This flow being right near the top had an upper chamber that was flowing at a slightly cooler temperature and it flowed onto the faster moving and hotter main flow. This was a sight to see. We would sit and watch this for about an hour. Great video can be viewed here. Another thing or danger about hiking to skylights is the nearby areas along the tube system. Usually further down the tube there will be areas of growing skylights where the crust is very thin and there’s a real danger of dying. If you don’t know how to locate such areas or have no understanding of how it all works, then stay away. Stay safe and stay alive. Watch my videos and look at my photos. Now it’s time for the next destination on this long outing. Puu Kahaualea and the Kahaualea lava flow #1. Estimated to be between 400-700 years old this cone has mostly stood protected from man until this hike. Before Pu’u O’o’s start in 1983 this cone was buried in the depths of a deep rain-forest. In 1983 Pu’u O’o a’a lava flows would surround the cone. Actually its two cones that are adjoined in the middle. Or one cone with two pits. More on that later. The Kupaianaha shield would form just southeast of the cone and leave the area with nasty shelly pahoehoe flows. In 2007 the new large rift would open from Pu’u O’o’s east spillway and track two miles to the east leading to the huge fissures that would seemingly cut off this area forever. A friend and I visited the early stages of the new fissures right away via a very tough hike up from Hwy 130 in Kalapana. There were at the time three perched lava lakes that stood between us and the ancient cone. I’ve always wanted to visit this cone but, the above flows made the trek too much and dangerous too with all the continued lava flow activity in the area. The perched lava lakes and following huge fissures and then the TEB vent would forever cut off access from the south. Then in early 2013 the flow coming from Pu’u O’o’s now large NE spatter cone would travel the long journey to this area and beyond. After our visit to the spectacular skylight, my friend and I set off for the ancient cone. Never having been to this side of the cone this was truly a new adventure. I had a good idea of where we had to go and how to avoid the huge older a’a lava flows. Remember, it’s dark but, my navigation skills are more than up to the task. It’s highly likely that no one has ever hiked here before. Helicopter visits to the area by HVO of course but, via hiking, unlikely. The flows butting up against the cones base were still mildly active so, now and then a slight glow was visible. Whether what we were seeing was near the cone remained a mystery as we trekked over newly formed pahoehoe flows. We stayed close to the edge of the 1980’s a’a flow for when we needed to vacate the hot flow at any time. The main part of this flows activity was now another 1.5 miles further to the NE heading in the direction of Pahoa. As much as I would have like to of hiked to the flows front, the ancient cone was my goal. I knew this might be the one and only time it could be safely reached. Once we reached the cone it was obvious the flow was still weakly active all around us. Nothing to worry about. It was a welcomed sight as the flow would provide heat on a very cold night. I explored the area to assure our safety and set out to try to capture some images. It was tricky as it was very windy and there was just enough misty rain to mess up my lens quickly. Also, there were too many places I wanted to be at for sunrise but, I of course had to settle on one. Once sunrise was over I wanted to see if we could get to the top of fissure D from the summer of 2007 eruption. We made several attempts but, the shelly pahoehoe was just too much and getting injured being nearly 10 miles from our vehicle wasn’t something I wanted to deal with so, we gave up on that and proceeded back to the cone to climb it. Climbing the cone was anything but easy. The flows that butted up to its n, w and s sides caused fires to spread over the area between the adjoining pits and this left deep cinder sides covered with a deep layer of burnt ferns and other flora. The cinder was about knee-deep and on a very steep slope. Every tree we would grab hold of would break as they had burned through. Once we did make it up to the top we were greeted with a great view and a truly old growth forest in the two pits. This is when I wondered, has any human ever been here before? Of course it’s surely possible. But, maybe not since ancient Hawaiian’s from back in the days when it first formed. Or never. Regardless, it was a special feeling of accomplishment to have reached the area after so many years of wanting to hike this area northwest of Kupaianaha. Also, to possibly be only one of a few people to ever see this cone in person. Now this might not mean so much to anyone who has bothered to read this far but, to an explorer like myself it doesn’t get any better. As much as I wanted to stay there for many more hours, I knew we had a long hike back and weather was moving in quick. Nothing new in the area surrounding Pu’u O’o vent. The route back had to go back up and by the skylight. The flows were warm and there was a brief break in the rain that allowed us to warm up a bit. The skylight was losing its vigor and in a sealing up stage. Timing is everything and this hike timing was perfect. I study the lava flows religiously and once again it’s paid off. This same scenario would play out for the next several months as it has for over two decades. Careful planning and great timing. Heavy cold rain would accompany us the entire way back but, it couldn’t dampen what was another great adventure. The only question is, how much of the trail is left? By now the first Kahaualea flow had died out and stalled way out in the middle of nowhere. The Kahaualea II flow was now going strong and headed north/northeast, north and northwest to the forests edge. Nothing but steady rain from the start all the way to the lava flow front. Lots of mud. The rain continued for the first few hours at the lava flows. The flow had progressed nearly down to the flats before the forest. It was on the old A’a flow section only 100′ from the cinder fields section. The flow was in an inflation stage so, forward progress was slow and the front was shallow and hot. I was able to kick back on the old a’a flow. Glow could be seen much further to the east on the other side of a large A’a flow. By now my feet are not recovering from each hike and they hurt constantly but, no way am I going to miss the progression of this lava flow event. Here it is only 2 days later and I’m back already. It was getting harder to estimate times the flow would arrive in certain areas so, it was best for me to hike back as often as my body could take it. Interestingly that large breakout from the past hike never did much where I had been as most of it went to the east. This left a small part of the old peninsula in tact. I brought along a prop on this hike. A tent. Now, I don’t camp or sleep no matter how long I’m out. I have a comfy bed at home for that. I go to the flows for the activity. The area was rugged with many small holes and old tree molds for the slow-moving flow to fill. The tent did allowed me to sit during heavy bouts of rain and still take photos. What I really wanted was images shot of the flows from inside of the tent at sunrise. I got some nice ones. Once play time with the tent was done I wondered from one small flow front to another. One even ventured into a shallow tube that had an exit end. This allowed me to get a couple of shots of the lava flowing inside the tube. The lighting wasn’t the best and these tubes are very damp so, the camera would fog up right away. There were several other tubes for the lava to enter but, they wouldn’t be reached on this day. The flow was in yet another inflation stage so, after my usual 8-9 hours out there I started my hike back. View images 6-13-13 Puu Oo Flow Video information. I shot a ton of footage on this hike with both cameras. The Nikon D800 footage needed to be split up into four videos. Its starts out with lots of night footage that features the first of what will be tons of degassing. As the lava covers areas of vegetation gases from it burn through the thin layer of flowing lava with small jetting sounds. This was the theme for this hike along with many small nearby methane explosions and several very large distant ones. Every time you here a thud its one of the two. The tent didn’t survive being dragged all over the old sharp lava so, it was sacrificed. Ever wonder what happens to an empty aluminum cam as its covered by lava? That’s in here too. Also some video of lava flowing inside of and old tube. You can here the moist ground getting covered. Also bouts of light rain hitting the hot flows. Most of the steam is from the moisture being evaporated with in the old tubes. Youtube 6 13 13 Lava Flow Hawaii Kilauea Volcano Lava Flow Nikon D800 Youtube 6 13 13 Lava Flow Hawaii Kilauea Volcano Lava Flow GoPro Hero 2 Youtube 6 13 13 Lava Flow Hawaii Kilauea Volcano Lava Flow GoPro Hero 2 Time Lapse 6-13-13 – 1 Hawaii Kilauea Volcano Puu Oo Vent Lava Flow Nikon D800 6-13-13 – 2 Hawaii Kilauea Volcano Puu Oo Vent Lava Flow Nikon D800 Watch for the bug meeting its demise. 6-13-13 – 3 Hawaii Kilauea Volcano Puu Oo Vent Lava Flow Nikon D800 The Ravioli can and degassing as the can breaks down. I guess this video needs more explanation as it’s getting hijacked and embedded all over the net. The can wasn’t sealed for a few reasons. One of course it would explode and I’m close enough to get shrapnel. Second, I’m over 9 hours into my outing and still more than 8 miles from my car so, I need the food. One ravioli were left in the can for the lava flow. The flow was like a curious small animal that kept following me as I ate my breakfast so, I gave it a bit to satisfy its hunger. The flow not only covered the can, it also melted it down. The flames are from de-gassing as the aluminum breaks down. Notice the flow inflate as this happens and then deflate some as the gas burns. It’s very likely that much of the can was now part of the small breakout at the end of the video. It was shot with a 180mm lens from maybe 10-15 feet. At the time the flow was mellow so, no worries. This isn’t my first time seeing lava consume objects. I’ve observed flows since 1991. I’ve watched cars and houses go to. Even a couple of propane tanks explode. The area where this can was filmed, there was 30 years of trash stashed in nearly every crevice that was also cleaned up by the flow. Not sure why Chef Boyardee gets such a bad rap. It clearly says “No Preservatives” 🙂 The can makes it easy to heat up on hot flows and it doubles as a place for packing out messy trash. The video can also be viewed on Youtube if that’s your preference. Propane tank exploding under small cabin being destroyed by lava. Propane tank exploding on hot lava flow. No, I didn’t put it there. I was hiding behind a wall on the cabin deck in the previous image link. My finger hit the shutter release reacting to the explosion. 6-13-13 – 4 Hawaii Kilauea Volcano Puu Oo Vent Lava Flow Nikon D800 Lava in an old tube. 6-13-13 Hawaii Kilauea Volcano Puu Oo Vent Lava Flow GoPro Hero 2 The tent and it demise. Also a nice methane explosion right in front of the camera. An alternate view of the previous videos ending. 6-13-13 Hawaii Kilauea Volcano Puu Oo Vent Lava Flow GoPro Hero 2 Time Lapse See how a small lava flow consumes a small tree. The flow inflates around it. Its only 4 days since my last hike and I’m beginning to wonder how many more times I can do this without a serious rest. Besides the rugged hikes it’s the no sleep situation too. My shoes are near their end after over 1 full year of use but, they fit so well its hard to get rid of them. Lets see, it rained. And then it rained even more. As if that weren’t enough it rained even more and harder. Very few photos were taken and my video didn’t record sound. It was tough but, fun as always. Part of the kipuka still survived and now the flow was further east away from the trail. The flow front was deep into the forest and the front couldn’t be accessed due to how active the flow was. I could only hang at its western edge. The amount of inflation from my last hike was astonishing. Not just in height but, in vastness too. As far as the eye could see it was a massively inflating lava flow with the forest in its path. In between this flow and the trail were large steaming areas where most likely the lava was deep underground burning roots and other vegetation. The methane explosions were just as powerful as the previous hikes but, they were well ahead of the flow front and deep into the forest. Remember I mentioned it rained a bit? Check out what my feet looked like after this hike. Each one felt like they had 1000’s of blisters on them. As with the previous hikes I took several photos of the area near the trails start into the forest if it was gone before I could return. The flow was both advancing and inflating rapidly on this visit. View images 6-17-13 Puu Oo Flow Video information. Youtube 6 17 13 Lava Flow Hawaii Kilauea Volcano Lava Flow Nikon D800 D800 didn’t record sound but, not a big deal as it was extremely windy with lots of rain. Lots of narration of what’s going on and where. Walking video. Shot in the small area between what use to be a peninsula and the main forest. Nice area for walking but, it was always a dead-end. Only five minutes to walk it. 6-17-13 Hawaii Kilauea Volcano Puu Oo Vent Lava Flow GoPro Hero 2 OnlyGoPro video. Lots of wind. Nothing I could do about the audio. One of the few times it wasn’t pouring. This is when you start taking note of what areas look like as they will be very different in videos from future hikes. It was a night or two after the super moon and it was still very bright. So bright it even lit up the forest. The forest was a muddy mess but, I had great weather this entire hike. By now the flow was much more widespread and a lobe had stalled only a 2 minute walk from the trail. There were flows further out and to the west and the larger flow to the east. That was only a 10 minute walk so, it was close and heading to the west. Got that? That large area of inflating lava from the last hike had busted loose maybe they day before as there was a massively large flow wiping out the forest. The flow was a very shallow and hot one that was an estimated 200 yards long and 50 yards deep. Yes, it was something to see. I made my way over large areas of hot and inflated lava strewn with fallen trees that were smoldering beside they’re burning tree molds. The pack had to stay on at all times out there. It was just too hot to set anything down. Every now and then I would have to stand on a fallen tree to keep my feet from blistering. No you’re shoes don’t burst into flames. They do melt but, you’re feet and other body parts start getting too hot long before stuff catches on fire. The near super moon and the intense glow from the large forest fires lit up everything like it was daytime. I also had great views of Puu Oo vent in the background. But, I could only stay in the area for a short time due to the intense heat and the threat of a new large flow cutting me off from the trail head. I had an emergency escape route if needed but, I really didn’t want to hike out via a 15 mile route. Once done in that area I made my way over to that western flow on the other side of the trail. This flow was in a very interesting area I knew well from years of stashing supplies nearby. Numerous shallow caverns filled the area. As luck would have it the flow was right at such stash that had a friends old tripod in it. I even called him to say I found it. Once again the near super moon lit up the entire scene beautifully. I stayed through sunrise. It was a very muted sunrise. Lots of thick clouds by then. Once it was light I made my way back to that eastern flow for some daylight shots. I was able to get near the flows leading edge that was heading west to the trail. This was that 200 x 50 yard flow and it had plenty to push it westward. I figured this was the one to finally take out the trail head. Instead of coming from straight out it was going to be a flow spreading along and into the forest. While at this western moving flow front I was able to capture some great video of the huge ferns drying out and bursting into flames as fast-moving breakouts surged forward. Also, small vortex’s of white ash. My gopro had yet another close encounter that had flames nipping at its lens before I could finally retrieve it. I also had a live walking stick bug crawl on me looking for safety. I did take it back to a safer area but, unless it got out of there somehow after I left, it met the same fate as 1000’s of other insects. The respirator was on most of this hike. The smoke was pretty thick at times. There were the usual methane explosions throughout the night and morning. I knew this was the last time I would see what bit of familiarity there was to an area that had become my second home over the past 2+ decades. Before leaving I sat and enjoyed it one last time. It was a beautiful morning. The birds were all signing and doing their thing and that one lone coqui frog had chirped away until daylight at the forest edge. He had been there since about march. Earlier a nice rainbow brightened the western sky. It was the last time I’d ever see the area as it was since the early 1980’s. View images 6-25-13 Puu Oo Flow Video information. Youtube 6 25 13 Lava Flow Hawaii Kilauea Volcano Lava Flow Nikon D800 Youtube 6 25 13 Lava Flow Hawaii Kilauea Volcano Lava Flow GoPro Hero 2 Time Lapse Youtube 6 25 13 Lava Flow Hawaii Kilauea Volcano Lava Flow GoPro Hero 2 There were times it was very windy and yet others when it was so quiet. Lots of video with lava and trees. Everything described above. 6-25-13 Hawaii Kilauea Volcano Puu Oo Vent Lava Flow Nikon D800 Long video with lots going on. Walking Stick insect. 6-25-13 Hawaii Kilauea Volcano Puu Oo Vent Lava Flow GoPro Hero 2 GoPro version includes a clip where flames engulfed the camera. Some narration. 6-25-13 Hawaii Kilauea Volcano Puu Oo Vent Lava Flow GoPro Hero 2 Time Lapse Short time-lapse. Sunrise, me, rainbow trying to form and forest burning. Before I went on this hike there were several times I was all but ready to go only to cancel at the last-minute figuring the timing was wrong. Seeing I have 5+ hours of driving round trip I want to be sure before venturing out. Fun south swells would keep me entertained. Surfing is great and there’s never enough of it. Yep, the usual rainy muddy mess until I arrived at the lava flows. I knew the lava had to of reached the trail by now and if it did come from the east as expected it might have cut off access to the flow field. As I neared what use to be the last 50 yards of the forest trail everything was very dark. I wondered if the flow had stalled as it had done many times. I could hear loud methane explosions in the distance to the east so, that lobe of the flow was still going strong. As I turned a bend in the trail there was the lava flow. A slowly moving lobe of pahoehoe. It wasn’t going anywhere fast as the forest floor was a muddy mess and I could see the main activity in that area was further to the west and moving back towards me and east. In other words the flow was moving back and forth as it ran into obstacles and it inflated. Once again the inflation was insanely large and fast too. Later after sunrise I would see lava inflated 20′, halfway up smoldering trees. After evaluating the situation I determined I was maybe 50 yards or so from what use to be the forest edge. (I say 20 in the video but, it was closer to 50) To my left on the other side of some thick ferns was a stalled but, very hot pahoehoe flow. It had fallen trees strewn all over it. Newly formed and still lit with flames were their tree molds. No problem staying warm on this cool night. I decided it was safe to venture out onto this stalled and inflating flow to see what was left of the old forest edge. Now, like I said before, the hiking shoes I had on were old and already shot so, ruining them wasn’t an issue but, knowing they would melt even more meant it was going to be an uncomfortable hike from there on out. As I made my way out onto the flow I could now see that the flow had left the forest front still standing. It was now a kipuka of trees. I made my way around to the front and the signs were still there along with a few of the small Ohia trees nearby. The kipuka its self had been completely burned through. Only the trees were still standing. Interestingly the trail was still muddy and green along with the small clearing that was once a tent staging area. The fire from the flow also burned up the many years of supplies that had been stashed all along the forests edge. Only remnants of items could be found. The flow making its way back to the east was now on the trail and slowly flowing out to the signs. This flow had lots of inflation behind it so, the kipuka didn’t stand a chance. For now on this visit it stood defiant to the inevitable. Through out the night I would venture back and forth from the forest and further to the west. At one point a real nice large forest fire broke out from the west flow. It lit up the trees by the trail and the milky way could now be seen high above the trees. These two images were captured. One at its brightest and the other as it faded. Daylight revealed a stunning scene of so much change from what I’ve always know the area to be like. Yes, the trail head was still there but, it stood all alone with a trail to nowhere barely sheltered by smoldering trees. I made my way further west to the western edge of this fast inflating lava flow to see what might be next to happen. A very large forest fire had burned with in the past 24 hours from the flows edge maybe 100 yards or so to the west and into the forest. You can’t hike into these burned out forest without a practical trail as they are littered with deep ash over many small caravans that will surely break legs. There was a real nice breakout of lava I got to get some images of. Also the remnants of a previous large methane explosion. The flow front I originally arrived to on the trail was now stalled and slowly inflating. It would more than likely be over run by other flows before it would go anywhere. Dried out vegetation was no longer burning from contact with it. I took a few more images and shot some video before heading back. The one last dead tree finally fell just before I left. Also, one real nice nearby methane explosion that shook the entire area. It was another great hike and having the forest front still there one last time was an added bonus for me. The amount of inflation told me this was the last time I’d ever see this area as it was. View images 7-06-13 Puu Oo Flow Video information. Youtube 7 06 13 Lava Flow Hawaii Kilauea Volcano Lava Flow Nikon D800 GoPro Hero 2 7-06-13 Hawaii Kilauea Volcano Puu Oo Vent Lava Flow Nikon D800 Everything described above. Another shocker. Heavy persistent rain. This time I have a new pair of the same hiking shoes. MerrellGeomorph Stretch blaze. These hiking shoes are great. Best is they are mesh so, water drains out. This time nearing the flow I meet the lava further into the forest. Right about where I had expected it to be. Therewere stalled dead lobes that could easily be crossed. Once again I arrived at the same stalled lobe from the previous hike. This was now the edge of the forest and just to the west the flow had gone deep into the trees to where I first hit the other stalled lobe. Read it a few times and you will get it. Even though it was dark and raining, I could easily see that thekipuka from my earlier hike was now gone. Its fallen trees lay dead where they once stood for decades. The flow inflated below them and lifted them all maybe 15-20′. Just beyond them were the signs burnt and mangled surrounded by inflatingpahoehoe. The poles themselves get pulled up with the inflating lava flow. The area was now buried under 20′ of new lava. Everything was much too hot to sit during the heavy rains so, I made my way to the west to find some cool older flows. I found a nice little area with some old fallen trees that was surrounded by a hot inflating lava flow. A perfect spot to sit out the next 3 hours of heavy rain. Hot thick steam would rise from the old flow keeping me plenty warm but, also soaked. Natures version of a stunning outdoor sauna with a nice view ofPuu Oo vent. I did manage to get off some photos at twilight and a short video with thegopro. Once again daylight allowed me to see just how much the area had changed yet again in such a short time. The weather cleared enough for me to get some great images and video. My poorGopro camera shut its self down multiple times due to excessive heat. It always came back for more. By now the housing is turning into a melted blob of plastic. Knowing I might not be back for several weeks, I stayed as long as my feet could stand it. My reason for knowing I might not be back were that the flows forward progress into the forest was reaching its end. It could and would progress further but, there were definite areas of higher elevation that would cause the flow to stall and inflate or even backtrack. The other scenario was it would stall the small tube feeding that flow and the majority of the lava flow would now be diverted to the tube feeding the larger northeastern flow. GoPro dominated for video on this hike. Had to break it up into four videos. 7-15-13 Hawaii Kilauea Volcano Puu Oo Vent Lava Flow Nikon D800 Short version of the hikes activity with bouts of heavy rain. 7-15-13 – 1 Hawaii Kilauea Volcano Puu Oo Vent Lava Flow GoPro Hero 2 Steam area, great surface flows with a glassy texture. Shows inflation. Did less clipping to show the flow of my filming. Narration. 7-15-13 – 2 Hawaii Kilauea Volcano Puu Oo Vent Lava Flow GoPro Hero 2 Walking and narration and some Ariel filming. 7-15-13 – 3 Hawaii Kilauea Volcano Puu Oo Vent Lava Flow GoPro Hero 2 Walking and narration. Short section of the trail that most certainly is gone now. Use to only be maybe one foot wide and you couldn’t see where your feet were landing. 7-15-13 – 4 Hawaii Kilauea Volcano Puu Oo Vent Lava Flow GoPro Hero 2 More walking and narration along with some Ariel filming. Back in Jan I thought maybe this might amount to 2 or 3 hikes as many times these flows don’t last very long. 7 months, 200+ miles later, my feet are shot. They were shot by May. Its been over 3 months since my last visit as I know little has changed other than the flow has nearly died out. Everything I once knew is gone forever. All of the interesting and challenging areas I use to hike are no more. Much of the upper flow field is now vast areas of treacherous shelly pahoehoe that shouldn’t ever be attempted to hike. The small flow front is now miles to the east of what once was the trail head. Large areas of fallen dead trees liter the route. Vast areas of hugely inflated lava that could breakout like a tsunamis surge. Be sure to find time to view all the videos I posted. I shot with both my Nikon D800 and the Gopro. I also shot time-lapse video with the Gopro. I had enough gear to carry as it was. Getting my pack down to 55 lbs for the last several hikes was a challenge. It was running 70 lbs. Several new images have been added to the volcano fine art gallery on my website. Images #462 – #492c for now. More might be added later. For those of you in Kona, they can be purchased at Krazy About Kona in the Kona Inn shopping village. I would say for so many obvious reasons if you read everything above, “Don’t try to do what I do” but, no need as you are already too late for visiting this area anyways. Like I said earlier, I have a very long history with this area. I knew there was a small window of opportunity for tracking these changes. Timing was everything. I did another short hike to lava since that last hike. That short walk to the ocean entry. That was the Discovery Channel Canada Daily Planet show. Feel free to share a link to this blog with friends via email or your favorite social network. One other note. I am no longer posting tofacebook. My fan page will stay in place to direct people to this blog but, no more posting. So, if you want to comment, please do so on the blog or on my website for each image. This was a tremendous amount of post production work that when I could find the time to work on it, it took months to do. Anyone who has ever shot and produced video can attest to how time-consuming it is. I had to leave out lots of great footage to keep the videos short enough that people would still watch them. An hour or two long documentary could easily have been made. I hope you enjoy this glimpse into my adventures. The image below shows what my feet looked like several times after 15 or more miles and hours on them and soaked to the bone. Excuse the formatting of the text. Had lots of issues when writing this up.